Enjoying Toledo » Is Mexican Food Recession-Proof? The parking lot to El Camino Real was packed last night… and so was the restaurant. I had a bean burrito with guacamole and D. had a taco and a couple of those chili relleno things he loves so much. And, we shared a pitcher of margaritas — my favorite reason to visit. It’s apparently a fave of a lot of Toledoans because there were some pretty tipsy folks out last night… like falling down on the ground tipsy. 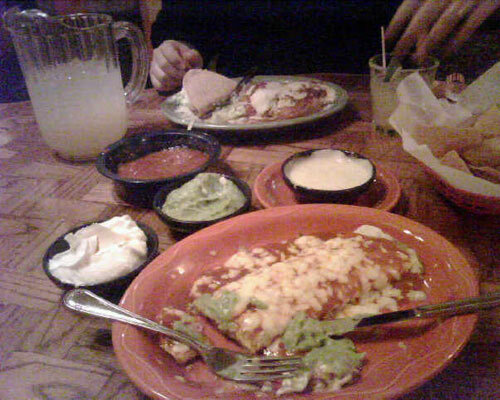 El Camino Real | 2500 W Sylvania Ave | (419) 472-0700 | There’s one on the east-side too… google it. P.S. Don’t drink and drive, K, thanks, bye.